PMR utilizes a triangulation methodology that is primarily based on overall expenditure on life science research and R&D funding and capital equipment installed base to obtain precise market estimations and insights on life science and biotechnology associated products, technologies, applications and services. Bottom-up approach is always used to obtain insightful data for the specific country/regions. The country-specific data is again analysed to derive data at a global level. This methodology ensures high quality and accuracy of information. Technological improvements in the humanized mice models, include insertion of human genetic material into mice for raising the resemblance with human metabolism and research on more number of human specific infectious agents, which reflects an opportunity for established market players. The production of next-gen humanized mouse models is expected provide exhilarating opportunities to establish robust small animal models for studying the pathogenesis of human-specific transferrable agents as well as testing the efficacy and toxicity of novel experimental vaccines and therapeutic agents. At a commercial level, the market is witnessing various updates, such as emergence of new techniques for customization, alterations of the host to further reduce innate immunity that hampers human cell engraftment, genetic modifications for providing human-specific growth aspects, and cytokines essential for optimal human cell function and growth. There has been a strengthening relationship between drug discovery and development process and the mice models. As a result, the efforts for extemporizing them is also increasing. Researchers and academicians worldwide are concentrating on the development of innovative vaccines and therapeutics employing humanized mice model, as the data collected from these models is helpful in predicting the clinical outcome of specific drug in development. This is anticipated to trigger the demand for these models in the pharmaceutical industry, CROs as well as academic and research institutes, thus, benefitting the market in turn. Lately in 2018, a team of Yale researchers has developed a new long-acting and less toxic HIV drug that suppresses HIV virus in humanized mice. A parallel study was conducted by researchers at the Temple University and the University of Pittsburgh for removing HIV DNA from the genomes of humanized mice model. In July 2017, Pharmatest Services had partnered with Taconic Biosciences in a bid to manufacture a new tentative mouse model with a human immune system, precisely made to research bone metastasis. Scientists of the Center for Infectious Disease Research (CIDR) have also discovered an antibody preventing malaria using a unique humanized mouse liver model. The complete success rate of drugs in the clinical development remains low despite large investments in drug discovery process, predominantly due to inconsistent pre-clinical research. Thereby, humanized mice models are being implemented for bridging the translational gap in the clinical phase. Several research studies have also demonstrated that genetically modified mice are efficient in the documentation of novel gene functions and finding novel drug targets. These models represent influential tools for validating such targets as well as assisting in disease and patient stratification studies. There has been an exponential rise in the employment of mice and other models for translational research and for the in-vivo evaluation of in-vitro selected molecules. 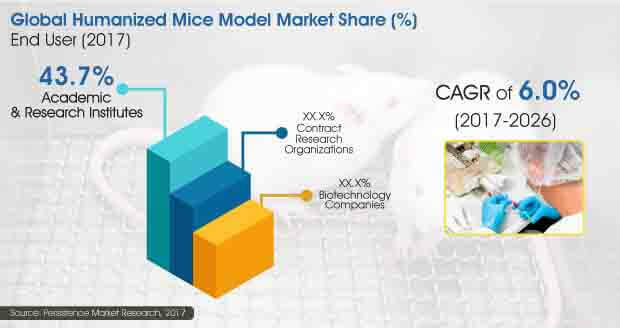 Moreover, growing demand for humanized mice model by clinics and laboratories is expected to push the market up in near future.